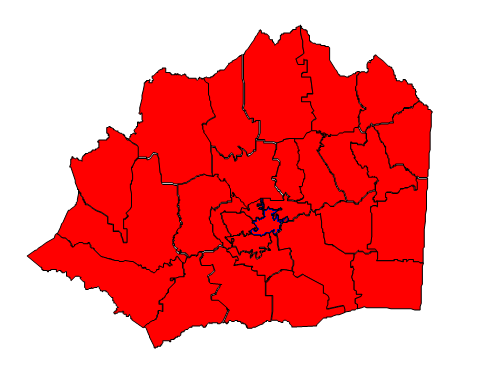 Wilkes County, located in northwestern North Carolina, is a bastion of Republicanism and has been since the Civil War. The county seat is Wilkesboro, but the largest town is North Wilkesboro. Once known as the “Moonshine Capital of the World”, Wilkes County played a huge role in the founding of NASCAR. The distribution of illegal spirits often involved making fast cars that could outrun federal police, leading to the development of what is now North Carolina’s official state sport. The first NASCAR race was held at the North Wilkesboro track, and NASCAR legend Junior Johnson still resides in the county. Another Wilkes County resident was Tom Dula (Dooley), immortalized in the folk song chronicling the murder of his fiancee and his subsequent hanging. Wilkes’ strong Republican heritage dates from opposition to secession during the Civil War, and a widely held view that Democrats were the party of secession. Despite many political realignments at the national level, Wilkes County remains solidly Republican. Forecast: Wilkes County has followed the trend of most other counties in the Foothills region, which is to say it has grown even more solid Republican with time. Most Republican candidates can be guaranteed to win at least two-thirds of the vote in Wilkes, often more. Romney broke 70% of the vote here in 2012 and won every precinct; Barack Obama is particularly disliked among the county’s voters. A Democrat other than Barack Obama would probably do better here, but not by much. The slow growth rate of 5.65% and stable demographics do not precipitate any change in the political environment for the near future. Thus, Wilkes can be expected to maintain its Republican tradition for a long time to come.